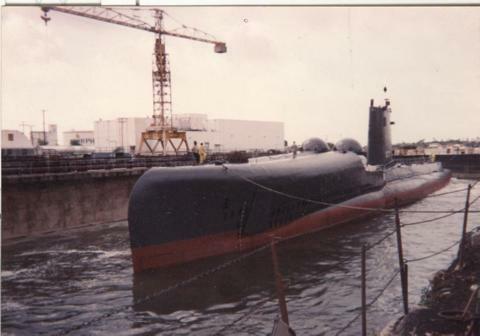 The fourth Growler (SSG-577), second of the Regulus II guided missile submarines, was built by the Portsmouth Naval Shipyard, Portsmouth, N.H. At her launching 5 April 1958 she was sponsored by Mrs. Robert K. Byerts, widow of Comdr. Thomas B. Oakley, Jr., who commanded the third Growler on her 9th, 10th, and fatal llth war patrols. Growler commissioned at Portsmouth on 30 August 1958, Lt. Comdr. Charles Priest, Jr., in command. After training exercises off the East Coast Growler sailed south for her shakedown cruise, arriving at the Naval Air Station, Roosevelt Roads, P.R., on 19 February 1959. After a brief run back to Portsmouth, she returned to the Caribbean in March to train in launching Regulus I and II guided missiles. Growler returned to Portsmouth 19 April via Fort Lauderdale and New London. Growler then proceeded to the Pacific via Norfolk, Key West, and the Panama Canal, putting in at Pearl Harbor on 7 September to serve as flagship of Submarine Division 12. At Pearl Harbor the guided missile sub participated in a variety of battle and torpedo exercises as well as missile practice before beginning her first Regulus Deterrent Mission. On this mission, which lasted from 12 March to 17 May 1960, Growler departed Hawaii with a full store of Regulus II sea-to-surface missiles, armed with nuclear warheads, and patrolled under a strict cloak of secrecy. The threat of Growler and her sisters, shadowy submarines silently gliding through unknown seas with their potent cargo, should deter any but the most foolhardy foe. The attitude of her crew, at sea on these silent missions for 2 months and more at a stretch, submerged for hours and even days, is nowhere better expressed than in the poem which traditionally opens each year's log. On New Year's Day 1961, as Growler prowled deep on her second patrol, Lt. (j.g.) Bruce Felt wrote: "Not our idea, of fun and good cheers, but doing our job to ensure many New Years." From May 1960 through December 1963 Growler had made nine such deterrent mission patrols, one of which, the fourth, terminated at Yokosuka, Japan, on 24 April 1962, as the Navy proudly displayed one of its newest and most effective weapons. Returning to Mare Island, Calif., in May 1964, Growler decommissioned 25 May and was placed in reserve. At present she is berthed at Mare Island with the Pacific Reserve Fleet.